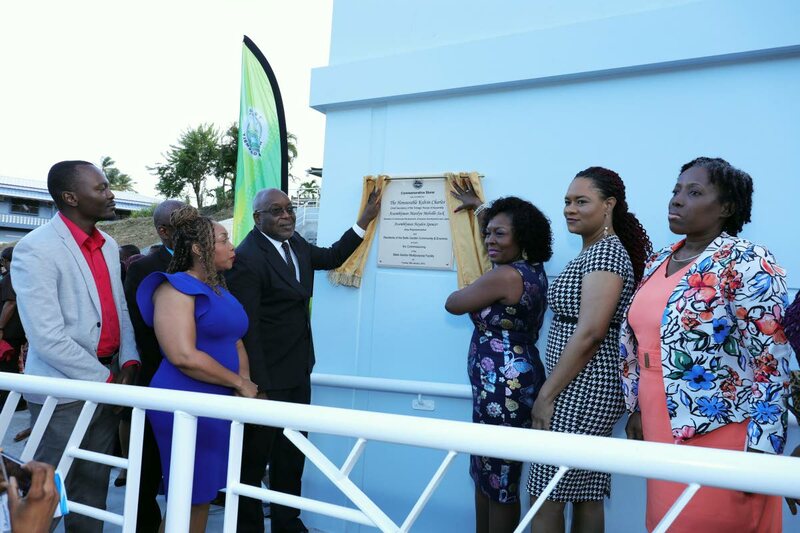 Tobago East MP Ayanna Webster-Roy, second from right, and Chief Secretary Kelvin Charles, third from left, participate in the commissioning of the new Belle Garden Multipurpose Facility on Tuesday. Others in photo from left are Assemblyman Ancil Dennis, Community Development Officer Michelle Burris, Secretary of the Division of Community Development Marslyn Melville-Jack, and Community Development Administrator Cherryl-Ann Solomon. Villagers and community groups, led by the Belle Garden tamboo bamboo band, turned out in their numbers on Tuesday to participate in the commissioning of the newly constructed $13 million Belle Garden Multi-Purpose Facility. Chief Secretary Kelvin Charles, in his address at the event, described Belle Garden as a hidden gem, as he expressed confidence that the facility would be adequately utilised given the large number of community groups in area. He also told villagers to look forward to the transformation of the existing great house into a museum and tourist attraction and noted other projects by the Tobago House of Assembly in the area such as a retaining wall and paving of roads, inclusive of agricultural access roads. "As an administration, it is our desire to see all Tobagonians rise up and own Tobago and be exceedingly proud of this unique land in which we reside and to preserve and protect our community from undesirable influences,” he said. MP for Tobago East, Ayanna Webster-Roy, described the facility as a gateway to human capital development, social transformation and economic development. Also speaking at the event, Secretary of Community Development, Marslyn Melville-Jack, urged residents to view the multi-purpose facility as an asset that would contribute to social cohesion and economic well-being of the community. Reply to "Villagers urged to use centre as gateway to development"